Travel by train along the scenic Nankai railway line before walking the final section of the Choishi Michi trail, the historic traditional approach to reach the temple town of Mount Koya, a bowl-shaped valley filled with cedar trees 800 metres up in the mountains of the Kii Peninsula. Mount Koya has been a place of religious devotion and ceremony since the 9th century, when Kobo Daishi founded the first temple and the Shingon sect of Buddhism. 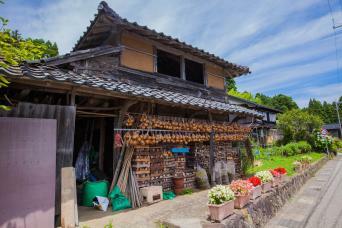 Today there are more than a hundred monasteries, many of which have Shukubo lodgings for pilgrims and other visitors. Stay in one of these lodgings run by monks and dine on Shojin-Ryori Buddhist vegetarian cuisine. 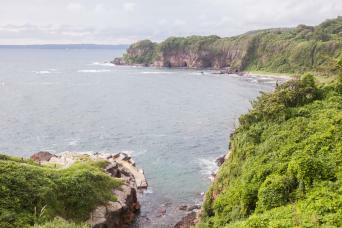 Stay for two nights, which includes accommodation in Shukubo monastery lodging, dinner and breakfast, as well as round-trip rail tickets from Kyoto or Osaka. 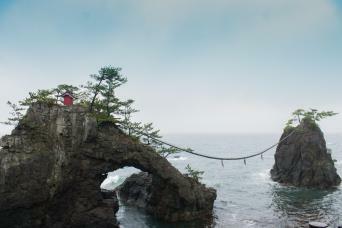 Include this experience in your own custom tour - it is ideal as a side-trip from Kyoto or from Osaka. Clients heading to the Kumano Kodo or Shikoku can include Mount Koya en route from Kyoto to the trail. Travel along the scenic Nankai railway line before hiking on the historic Choishi Michi trail to the temple town of Mount Koya, a bowl-shaped valley filled with stands of cedar trees 800 metres up in the mountains of the Kii Peninsula. Today you may wish to explore the main street of Koya, which leads to the atmospheric Okunoin graveyard. Overnight at a Japanese Shukubo monastery lodging. Today you will have chance to explore more of Mount Koya. 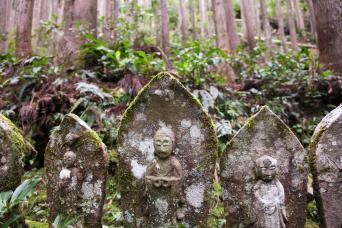 Visit the atmospheric Okunoin cemetery, with thousands of graves and memorials to feudal lords and other past luminaries. Head onwards by train from Mount Koya. There may be time in the morning to explore this mountain-top settlement further.